We were proud to host supporters and sponsors from some of the top financial firms on November 5th at the 9th Annual Wine & Spirits Charity Event. Our hearts go out to our friends in NY, NJ, and beyond who were affected by Hurricane Sandy and unable to join us. In the face of a tragety, we were honored to see your steadfast support proving that nothing can stop the fight against cancer. Despite the impact of Hurricane Sandy, the financial community came out to support cancer research and patient care programs, including the Foundation's newest initiative, Kids Golf Day. The event was a tremendous success raising much needed funds. The Foundation was elated to have NFL legend Doug Flutie join guests at the Private Champaign Affair. Les Zygomates' chef and sommelier were onsite to treat guests to homemade pate and exquisite champagne. At the main reception, attendees were able to sample and savor cocktails, beer, and wine. There were great items to bid on at the Live Auction like a signature Bill Belchick autographed sweatshirt, a Bruins package with a tour of the lockerroom and broadcaster experience, and much more. Andy Nesvet was the lucky raffle winner who walked away with a fabulous trip to Jamaica for 10 in a private villa. Thank you to all who participated and supported the cause. Jack Streeter, a 16-year old cancer survivor from Needham was the featured guest speaker. Jack gave a heartfelt testimonial on what it's like to have cancer as a child, and the difference that everyone was making. A moving video was shown highlighting the Expect Miracles Kids Golf Day program and the impact it has for families coping with cancer. With Jack's powerful words, we're thrilled to announce that over $11,000 was raised within minutes to support the Expect Miracles Kids Golf Day and pediatric cancer research, contributing to the $200,000 total raised as part of the event. The audience truly came together. 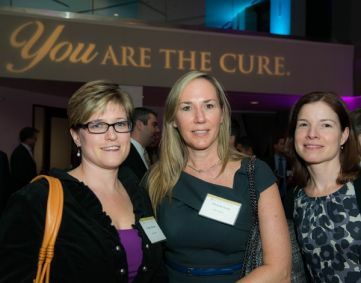 Thank you for making a difference in the lives of current and future cancer patients. If didn't have a chance to contribute, you can still make a donation. YOU are the cure. Together we can expect miracles.